Warner Bros. Release The First Trailer & Poster for Tim Burton's 'DARK SHADOWS' Starring Johnny Depp! Warner Bros. have released the first trailer & poster for Tim Burton's upcoming adaptation of the cult TV series Dark Shadows. Johnny Depp stars as Barnabas Collins, an 18th century businessman, who just before the Revolutionary War was transformed against his will into a vampire & buried in a tomb for two centuries. After he finally emerges, uncovered by construction workers in the year 1972, he seeks out his descendants as well as some long-ago foes and a possible lost love. 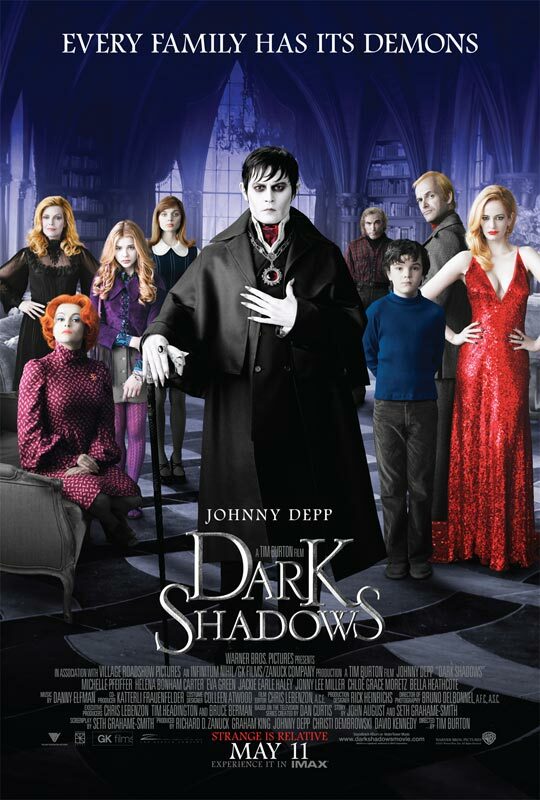 Dark Shadows also stars Helena Bonham Carter, Eva Green, Jackie Earle Haley, Jonny Lee Miller, Bella Heathcote, Chloe Moretz & Gulliver McGrath. The movie hits theaters May 11th. Hit the jump for the details. I'm reading: Warner Bros. Release The First Trailer & Poster for Tim Burton's 'DARK SHADOWS' Starring Johnny Depp!Tweet this!